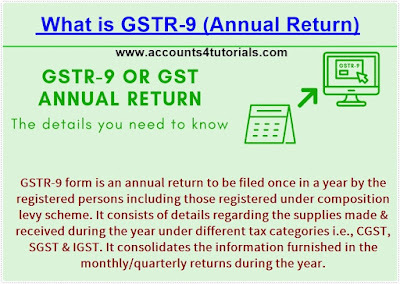 GST annual return Form-9 format has been issued by the Government, the taxpayer is going to file a very first annual return under GST act after implementation on 01.07.2017. This time we need to file the annual return for the period of 01.07. 2017, to 31.03.2018. Since the implementation of new GST system lot of changes & amendments in the act and rules in GST act & rate changes. Finally, we are in the stage of filing an annual return. GSTR-9 is an Annual Return to be filed by Registered Taxpayers under GST (Including Composition Dealers). GSTR-9 form is an annual return to be filed once in a year by the registered persons including those registered under composition levy scheme. It consists of details regarding the supplies made & received during the year under different tax categories i.e., CGST, SGST & IGST. It consolidates the information furnished in the monthly/ quarterly returns during the year. Persons Paying TDS under section 51 of the Act. GSTR 9: GSTR 9 should be filed by the regular taxpayers filing GSTR 1, GSTR 2, GSTR 3. GSTR 9A: GSTR 9A should be filed by the persons registered under composition scheme under GST. GSTR 9B: GSTR 9B should be filed by the e-commerce operators who have filed GSTR 8 during the financial year. GSTR 9C: GSTR 9C should be filed by the taxpayers whose annual turnover exceeds Rs 2 crores during the financial year. ** Note: All such taxpayers are also required to get their accounts audited and file a copy of audited annual accounts and reconciliation statement of tax already paid and tax payable as per audited accounts along with GSTR 9C. GSTR-9 due date of filing is on or before 31st December of the subsequent financial year. For Instance, for financial year 2017-18, the due date for filling GSTR-9 is 31st December 2018. The Late Fees for Non-filing of GSTR-9 within the due date is Rs. 100/day per act (i.e., CGST Rs.100 & SGST Rs.100) up to a maximum of an amount calculated at a quarter % of the taxpayer turnover in the state or union territory. Thus, the total penalty is Rs. 200 per day of default (i.e., CGST & SGST). There is no late fee on IGST. List of tax invoiced issued during the period and reconciliation of the same with books of accounts, this also should be reconciled with the turnover declared in the audited financial statements. List of debit/credit notes issued during the period and reconciliation of the same with books of accounts. In case a company has the different units/branch all over India, then the stock transfer between units/branches also to be reconciled with the books. Reconciliation of advances received and GST paid for goods & services during July 1 to 15th November 2017 and advances received for services and GST paid for that from 15th November 2017 to 31ST March 2018. Reconciliation discount is given to the customer with purpose and recheck if the same under GST act allowed or not. List of Purchase & other service bills accounted during the period & Input credit taken on the same and further reconciliation with the books and returns. Reconciliation of input credit availed and also ensure that all the availed credits are eligible as per the act and the ineligible credits, common credits are reversed & accounted properly. Reconciliation of Reverse charge GST (RCM) payable till the applicable date on all the applicable expenses and paid the same. Reconciliation of monthly/ quarterly GST returns with the books of accounts and all the taxable, exempted & non-GST turn over declared in the returns if any differences, reason for the same. All the credit taken on TRAN-1 credit reflecting in the GST portal is to be mentioned in the return and make sure there is no issue related to credit. In case of any refund application filed with the department and eligibility & status of the same. GSTR-1 and GSTR-3B filed during the year, facility to download system computed GSTR-9. Consolidated summary of GSTR-1 will be made available. Consolidated summary of GSTR-3B will be available in PDF. GSTR-9, values will be auto-populated in tabular format based on GSTR-3B and GSTR-1 of the year. Values will be editable with some exceptions (table 6A, 8A, and tax payment entries in table 9). NIL return can be filed through a single click. Auto-populated GSTR-9 (System generated) to be download from the portal before filling up values. Table 6A and table 8A will be non-editable. After filling up the values, JSON file to be generated and saved. After logging on the portal, the JSON file to be uploaded. File will be processed and error will be shown. Error file to be download from the portal and to be used in the Excel tool. Make corrections, file to be uploaded on the portal. Corrections to be made online except table 17 & 18 ( number of records should not exceed 500 in each table). Return filled can be downloaded as PDF or Excel. No revision facility so return should be filed after reconciling the information. No payment is to be made with annual return except late fee and Payment to be made on a voluntary basis in DRC-03. 7) What are the details required to be filed under GSTR-9 Return? Basic details of the taxpayer have 3 sections consists of Financial Year, GSTN, Legal Name & Trade Name (If any). Details of ITC declared in returns filed during the FY. This will be summarized values picked up from all the GST returns filed in previous FY. Details of tax paid as declared in returns filed during the FY. Particulars of the transactions for the previous FY declared in returns of April to September of current FY or up to the date of filing of annual returns of previous FY whichever is earlier. Usually, the summary of amendment or omission entries belonging to previous FY but reported in Current FY would be segregated and declared here. 14 Differential tax paid on account of declaration in 10 & 11 above. Q1.What is Legal provision for filling GST Annual Return? Further, as per section 35(5) of CGST Act, every registered person whose turnover during a financial year exceeds the prescribed limit (Rs. 2 cr.) shall get his accounts audited by a chartered accountant or a cost accountant and shall submit a copy of the audited annual accounts, the reconciliation statement (GSTR-9C) under sub-section (2) of section 44 and such other documents in such form and manner as may be prescribed. Reconciliation statement – GSTR-9C is a reconciliation of data as per books of accounts and data as reported in GSTR-9. Q2. Who is required to file GSTR-9? Is there any threshold limit of Turnover for an exemption to file GSTR-9? Q3.Who is not required to file GSTR-9? A person paying tax under section 52 (TCS) is required to file GSTR-9B but since the provision of section 52 is applicable from 01st October 2018 only, they are not required to file GSTR-9B for the year 2017-18. Q4.What is Form GSTR-9A and who is required to file it? Q5.What is Form GSTR-9B and who is required to file it? Ans. GSTR-9B is Annual return for the person paying tax under section 52 which is the person who is required to collect a tax. Since the provision of section 52 is applicable from 01st October 2018 only, such persons are not required to file GSTR-9B for the year 2017-18. Q6.Which Annual return is to be filed by a taxable person if he was earlier registered as composition taxpayer but later he switched over from composition scheme and his status as on 31st March 2018 is a regular taxpayer? Q7.Whether a Taxpayer shall be required to file GSTR-9 even though his registration has been canceled before 31st March 2018? Whether answer remains the same if his application for cancellation was pending as on 31st March 2018? Ans. As per Legal provision of Section 44(1) of CGST Act, every registered person shall be required to file GSTR-9. Hence, even if the status of a taxpayer is not registered as on 31st March 2018 but he was registered between July-17 to March-18, he shall be required to file GSTR-9 providing details for the period during which he was registered. Q8.Whether Taxpayer shall be required to file GSTR-9 even though he was having Nil Turnover during the year 2017-18? Q9.What is the Due date of filling GSTR-9? Ans. 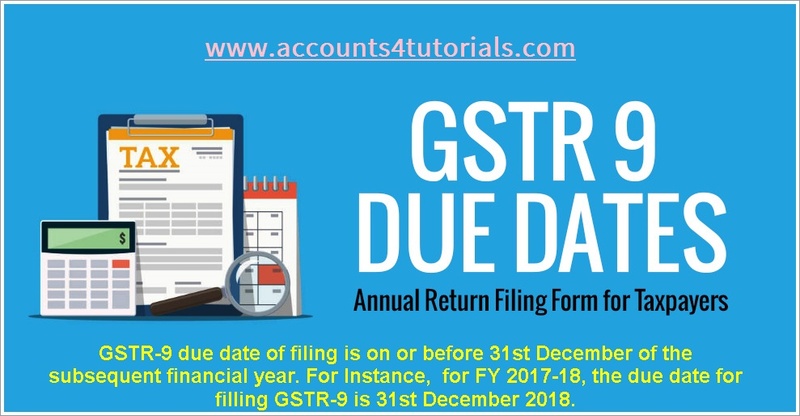 As per section 44(1) of CGST Act, every registered person is required to file an annual return on or before 31st December of the year succeeding the financial year in form GSTR-9. For the FY 2017-18, the due date of filling GSTR-9 is 31st December 2018. Q10.Whether transactions for the period April-17 to June-17 are also to be included in GSTR-9 for FY 2017-18? Q11.If a Taxpayer has obtained more than one GST Registration even though he has a single PAN, then whether GSTR-9 is to be filed at Entity level or GSTIN wise? Q12.What is the difference between GSTR-9 and GSTR-9C? Ans.As per section 35(5) of CGST Act, every registered person whose turnover during the financial year exceeds prescribed limit (Rs. 2 cr.) 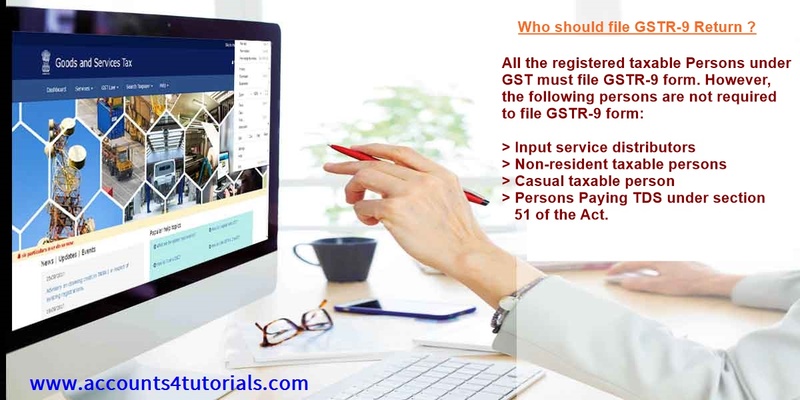 shall get his accounts audited by a chartered accountant or a cost accountant and shall submit a copy of the audited annual accounts, the reconciliation statement under sub-section (2) of section 44 which is called GSTR-9C and such other documents in such form and manner as may be prescribed. Hence, the requirement of GST Audit u/s 35(5) would arise only if prescribed limit of turnover exceeds Rs. 2 cr. and certified reconciliation statement -GSTR-9C shall require to be submitted. Q13.Which are the parts of information sought in GSTR-9? Q14.What will be a source of information for filling up GSTR-9? Ans.GSTR-9 is merely a compilation of data filed in GSTR-3B and GSTR-1. As per the instructions of the form GSTR-9, it is stated that information of outward supplies ‘may’ be derived from Form GSTR 1. Hence, so far as Outward supplies and tax payable in the annual return is concerned, the same is to be extracted from Form GSTR 1 only. Q15.If the taxpayer has identified some information which are missed to be reported in GSTR-3B or GSTR-1, whether the same can be added while filing GSTR-9? Ans. As discussed above, it seems that GSTR-9 is a merely compilation of data filed in GSTR-3B and GSTR-1 and no other information can be incorporated in GSTR-9. 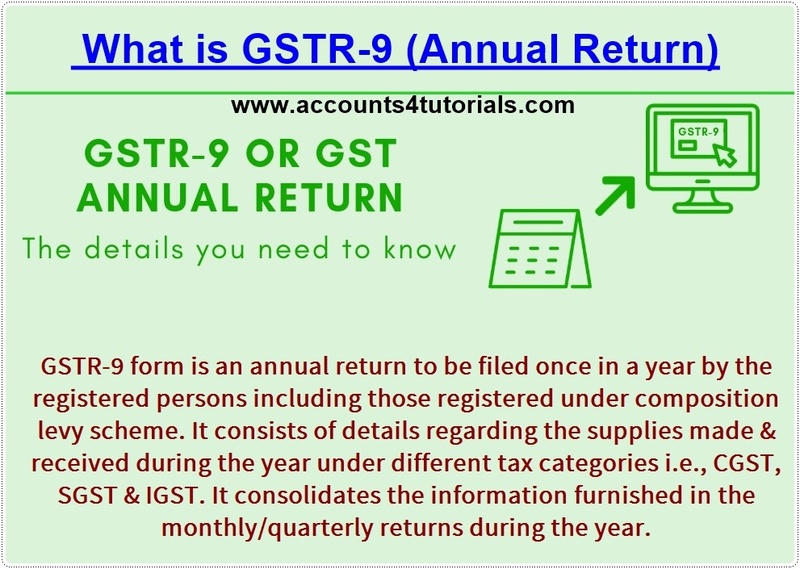 GSTR-9 requires details from monthly/quarterly returns on ‘as is’ basis. Even if a taxpayer has identified data fed in GSTR-1 / GSTR-3B as incorrect, still the same data is to be taken for reporting in annual return. The actual data present in the financial statements and the books of accounts of the entity is not to be considered at all for the purpose of reporting in annual return. So, the intent of the form is not to allow rectification of data filed in the monthly/Quarterly returns but the only aggregation of such data in respect of the financial year. Q16.If no other information can be furnished in GSTR-9 over and above what is stated in GSTR-1 and GSTR-3B, then how can the taxpayer pay the tax liability in case he identifies certain liabilities which are missed to be reported? Q17.If GSTR-9 is a compilation of the earlier returns (GSTR-1 / GSTR-3B) filed, then whether GSTR-9 will be auto-populated? Ans: Only the fields mentioned in the Form as ‘auto’ will be auto-populated. The Government is yet to clarify regarding the auto-population of rest of the fields. Q18.What is the difference between Legal Name and Trade Name? Ans. Legal name is a name given by statue which is generally found in PAN. A trade name is a name from which entity is known generally brand name. The person may have the legal name which is different from Trade name e.g. “Maggi” could be a trade name while its legal name is Nestle Limited. Legal name and trade name will be auto-populated from GST Registration. Q19.Which information shall be provided in Table 4? Which was already reported in returns filed during the financial year that is for the period July-17 to March-18 is to be reported in Table-4 of GSTR-9. Please note that the expression return filed during the financial year will have to be read as the return filed for the financial year. Even belated returns filed for the period July-17 to March-18 is to be considered for providing information in Table-4. E.g. Taxpayer has filed GSTR-1 for the month of August-17. Now he has identified one invoice to be amended in August-17 return. If such amendments have been made up to March-18 return, then the same will be reported in Table-4K/4L of GSTR-9. However, in case such amendment is made in GSTR-1 of April-18, then the same will be reported in Table 10 or 11 as the case may be. Q20.Where to report DN / CN issued to unregistered person? Ans. Unlike B2B supplies, DN/CN issued to an unregistered person is to be adjusted against outward supply and net supply and is to be furnished in Table 4A. Even credit note raised against transaction reported as B2C in GSTR-1 is also to be adjusted in Table-4A. Q21. Whether supply made to the registered person (B2B) as required in Table-4B also includes outward supply on which tax is payable by the recipient on a reverse charge basis? Ans. No, an only outward supply made to the registered person on which tax is payable on the forwarding charge basis by the supplier will be reported in Table 4B. Outward supplies under a reverse charge shall be reported in Table-5C. e.g. in case of GTA operator filing his GSTR-9, he is required to report outward supply in Table-5C. Q23. The taxpayer has made two type of exports, one with payment of tax and the other without payment of tax. Where to report both these transactions? Ans. Export with payment of tax is to be reported in Table-4C. This table warrants details of transactions where tax is payable. Exports without payment of tax is to be reported in Table-5A. The same principle will hold good for supply to SEZ also. Q27.Which information shall be to be provided in Table 4G for Inward supply on which tax is to be paid on reverse charge basis? Q28. Whether credit note/debit note issued during 18-19 in respect of transactions of July-17 to March-18 is to be reported in Table 4I and 4J? Ans. No, only credit note/debit note issued and disclosed in the GST returns between July-17 to March-18 is to be reported in 4I and 4J. If the issue date of credit note/debit note is ranging between July 2017 to March 2018 and if the same has been reported in the GST returns during the period April – September 2018, then it will form part of Part V of the Annual return. However, if the issue date of the credit note/debit note is after 31st March 2018, then it needs to be reported in the Annual return of 2018-19 even though the invoice to which it relates may belong to the period 2017-18. Ans. Amendments in supply are to be reported in Table-4K, 4L, 5J, 5K, 10 and 11 depending on the nature of the transaction. E.g. If the value of original B2B supply is Rs.1000 but which was reported as Rs.100 in GSTR-1 and subsequent amendments have been made in next GSTR-1 with correct value then Rs.100 will be reported in Table- 4B and Rs.900 will be reported in Table-4K. Ans. Details of outward supplies on which no tax is payable like Export or SEZ supply with LUT or Bond is to be reported in Table-5. Even outward supply on which recipient is liable to pay tax on RCM basis is to be reported here only. Q32. GSTR-3B doesn’t require ITC to be bifurcated into Input, Input service and capital goods whereas Input tax credit details as per Table-6 requires such breakup. How to report the same? Ans. Basically, GSTR-9 is prepared based on an earlier process of filling GSTR-1, GSTR-2, and GSTR-3. In GSTR-2, there was a requirement to bifurcate ITC into Input, Input service and capital goods. However, as GSTR-2 was not required to be filed till now, one will have to carry out an additional exercise to identify the category of ITC into Input, Input service, and capital goods from books of account. Ans. No. ITC of TRAN-II credited in electronic credit ledger up to 31st March 2018 only be reported in Table-6L. The same way any reversal which has an impact on electronic credit ledger up to 31st March 2018 is to be reported in Table-7G. Q36. What is the scope of Table-7 so far as Table 7A to 7D is concerned? As per proviso to section 16(2) of CGST Act read with Rule 37 of CGST Rules, Amount of ITC reversed on non-payment of the value of supply along with tax within a period of 180 days from the date of the invoice is to be reported. Rule 42 of CGST Rules describe the manner of determination of input tax credit in respect of inputs or input services and reversal thereof. If Input and Input service is used partly for business purpose and party for non-business purpose or such input and input service is used for effecting taxable supply and exempt supply, then ITC reversal is required as per Rule-42. ITC reversed as per Rule-42 is to be reported in Table-7C. Q37.Whether ineligible ITC as reported in Table-4D of GSTR-3B is to be reported in Table-7E of GSTR-9? Ans. No, Net ITC as per GSTR-3B does not take into consideration ineligible ITC as reported in Table-4D of GSTR-3B. So auto-populated figure of Net ITC in Table-6A of GSTR-9 does not contain ineligible ITC. Since taxpayer has not availed such ineligible ITC at all, there is no requirement to reverse it. This will be applicable in a situation wherein Table 4A of GSTR 3B does not contain the amount of ineligible input tax credit. Q39. Which information is contained in GSTR-2A Table-3 and Table-5 which are auto-populated in Table-8A of GSTR-9? Ans. Table-3 of GSTR-2A contains details of inward supplies received from a registered person other than supplies attracting Reverse charge and Table-5 of GSTR-2A contains details of Debit note/credit note received during the current period. GSTR-2A reflects total ITC passed on to the taxpayer but out of that taxpayer might not have claimed some ITC voluntarily (to be reflected in Table-8E) or he might not have claimed the same because it is ineligible (to be reflected in Table-8F). Further, at the time of Import, Taxpayer would have paid IGST but he might not have claimed full IGST paid as an input tax credit. Sum total of the above differences are input tax credit which will not be available to the taxpayer in 2017-18 is what Table-8 want to draw down. Please note that there might be a situation where some ITC available in GSTR-2A but the taxpayer may not have claimed it up to March-2018 but claimed during April-18 to Sep-18, that credit is also to be reported in Table-8C. This ITC will not form part of total ITC to be lapsed. Unlike a normal Input tax credit, the government has not provided a mechanism to report IGST on Import paid during 2017-18 but claimed in April-18 to Sep-18 which taxpayer can legally claim. More clarification from the government is expected in this regard. Q42.Which period information is to be provided in details of tax payable and paid in Part-IV Table-9? Q43.What is the scope of Part-V Table-10 to 13? Ans. Table 10 to 13 plays a very important role in GSTR-9. Any changes in the supply of July-17 to March-18, made through Amendments, credit note or debit notes which were reported in GSTR-1 of April-18 to September-18 is to be reported in Table-10 if the same is resulting into increase in the value of supply. However, if it is resulting in the reduction in value of supply then the same is to be reported in Table -11. Also, if there are any invoices which belong to the period of 2017-18 but completely reported in Form GSTR 1 of 2018-19 for the first time, they will fall within the scope of Part V Table 10 to 13. An important point to note here is that only credit note or debit note issued during April-18 to September-18 for supply effected during July-17 to March-18 is to be reported in Table-10 and 11, as the case may be. Similarly, if any input tax credit belongs to the period July-17 to March-18 but which has been claimed in GSTR-3B of April-18 to September-18 is to be reported in Table-12 and 13. If the same is resulting into the reversal of Input tax credit, then it will form part of Table 12 and it will be reported in Table-13 if the same is resulting into an addition of input tax credit. An important point to note here is that only additional or reduction in ITC belongs to July-17 to March-18 is to be reported in Table-12 and 13 as the case may be. Ans. GST Refund claimed during July-17 to March-18 is to be reported in Table-15A. If the refund is sanctioned after March-18 then that is not to be reported in Table-15B. The same principle will hold good for other refund and demand details. Cutoff date to report transactions here is 31st March 2018. Ans. No. Non-GST refund claim, as well as Non-GST demand, is not to be reported in table-15. Ans. No, demand of tax for which an order confirming the demand has been issued by adjudicating authority shall be reported in Table-15E. Only notice received asking for reasons/reconciliation of tax differences between returns filed cannot be said to be an order confirming demand of tax. So, the same will not be reported in Table-15E. transaction to be reported in Table-16B. Ans. No, this situation gets covered by section 141 of CGST Act and not by section 143 of CGST Act. Hence, they are not required to be reported. If goods are returned within the stipulated time as provided in section 141 then no tax shall be payable. However, if goods are returned beyond the stipulated time as provided in section 141 then input tax credit availed by the Principal shall be recovered as arrears of tax under CGST Law and no input tax credit of such tax paid shall be allowed under the CGST Law. Ans. GSTR-9 is prepared based on the earlier process of filling GSTR-1, GSTR-2, and GSTR-3. In GSTR-2, there was a requirement to report details of HSN wise summary of inward supplies. However, as GSTR-2 was not required to be filed till now, one will have to carry out an additional exercise to identify and report HSN wise summary from the books of accounts. Ans. As per section 47(2) of CGST Act, Late fee for the belated filing of GSTR-9 is Rs.100 per day subject to a maximum of 0.25% of turnover in a state/UT. A similar provision is there in SGST Act also. Hence, in total there will be a late fee of Rs.200 per day subject to 0.50% of turnover in a state on the late filing of GSTR-9.